We’re huge fans of Oasis here at Lustrous, so it was a lovely treat to step into their spring garden last week for a glimpse of what’s to come for the season ahead. Before we delve into the beautiful clothes, we must mention the stunning set up. Greeted by little rabbits on the stairs and sipping on tea from the prettiest china cups, it felt like we had been transported to fantasy wonderland on a dreary Wednesday morning! Now about the clothes! The room was awash with colour with stunning florals, soft suedes, variegated stripes and boho prints all in the mix. 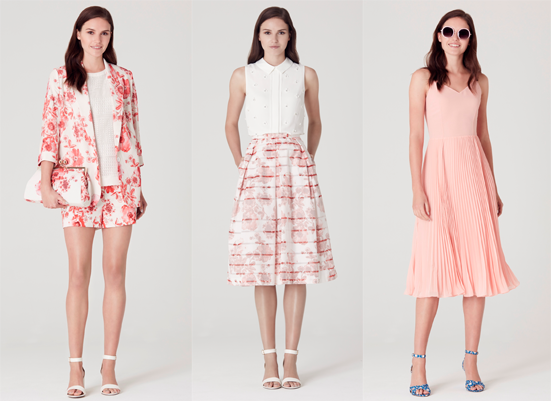 SS15 is all about separates with an abundance of cute co-ords in beautiful colours and prints. Skirts are big news this season, from pretty midis to wrap pencil styles revealing thigh high splits. Monchrome is still key but Khaki takes the lead as the new neutral. And there’s plenty of pretty pastels to satisfy those who crave soft summer hues! In terms of accessories, Oasis bring their A game with these reversible coloured tote bags. Just perfect for summer holidays!